Since its official inauguration in September 2015, the Lüneburg Adhesive Academy, our newest technical center of excellence, has been hosting many training sessions and adhesive demonstrations, frequently aimed at improving customer processes and reducing waste. Interestingly, it’s not only customers that appreciate the inspiring environment that our Adhesive Academy offers for the exchange of innovative ideas. Some local organizations also have discovered the opportunity of holding vivid events and conferences about wider industry relevant topics at our Adhesive Academy. Our latest event focused on resource efficiency, discussing how careful resource management can contribute to a company’s economic success. 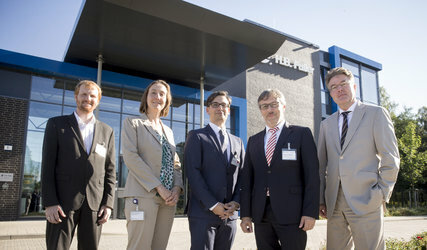 Organized by the WLG – the Economic Development Company for the city and district of Lüneburg – in collaboration with the VDI-ZRE – the Centre for Resource Efficiency of the Association of German Engineers – it attracted representatives from local companies interested in learning more about the benefits of resource efficiency and available government funding for the implementation of related initiatives. VDI-ZRE is funded by the German Federal Ministry for the Environment, Nature Conservation, Building and Nuclear Safety through the initiative for climate protection. Its representative, Stefan Kirmes, explained how the VDI supports small- and medium-sized companies in calculating the benefits of a more efficient use of their resources and in achieving savings. Christian Scherrer, representing the WLG, described the government funding possibilities and eligibility criteria, ranging from funding for consultants and subsidies or loans for innovative development programs, up to funding of measures aimed at increasing material-, energy- and resource efficiencies. Our own Elizabeth Staab, marketing manager, packaging solutions, presented examples of how we embrace resource efficiency in our operations. She also discussed how H.B. Fuller acts as an enabler for our customers across numerous industries to achieve their sustainability goals with new industrial adhesive solutions. For example, we can help increase efficiency, and reduce energy consumption and waste through our industrial adhesive technologies. 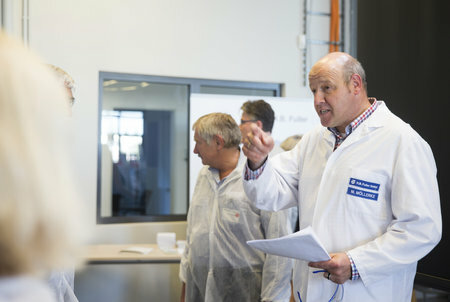 In addition, our guests had the unique opportunity to visit our laboratories and manufacturing site, and learn more about how adhesive solutions can help customers improve their processes. At H.B. Fuller, we connect what matters not only in industrial adhesives and the material world. We connect people with innovative ideas that can help shape our future. Did you know that our Adhesive Academy is a LEED® certified to the Gold level? This requires the fulfilment of a number of conditions, including the efficient use of energy and water, as well as waste reduction initiatives. Learn more about the LEED®journey or about our sustainability commitment.